mATX form factor brought to you by popular demand! 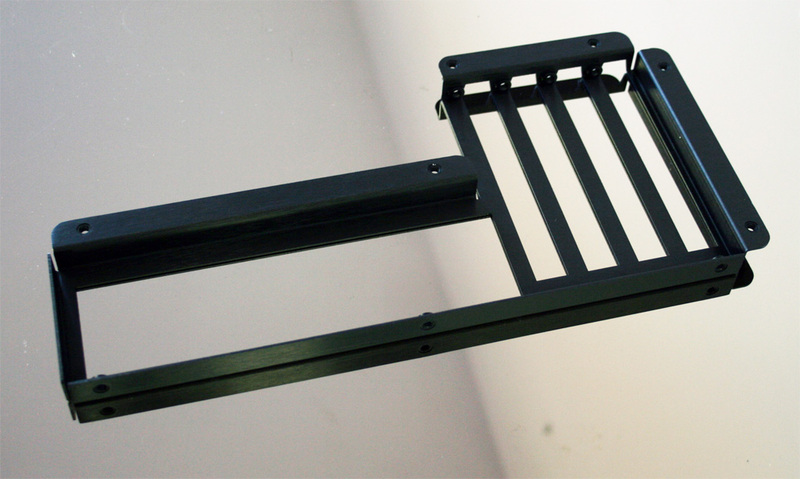 Mountain Mods - Modular I/O Panel is made of 1mm thick industrial aluminum. It is laser precision cut from a flat sheet using an Amada Gemini FO3015-NT laser machine. Then the grain is applied and the angles (flanges) formed using Amada precision hydraulic brakes. Lastly the threaded inserts are put into place using a 5000lb hydrualic press. They are manufactured in the USA by skilled metal workers. Mountain Mods - Modular I/O Panels are of the highest quality on the market. The use of threaded inserts throughout give the piece longevity of use as threaded inerts are not as prone to strip as tapped material. They are easy to implement. Just mark and drill clearance holes for the threaded inserts. Attach 6-32 screws and GO!.